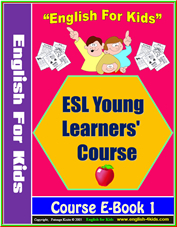 English for Kids - Book 1 Unit 5 - Colours - What colour is it? colours: what colour is it? This unit offers lesson plan resources for teaching kids colours.The resources include: a suggested lesson plan, Powerpoint presentations, Flashcards, Video Slideshow, PDF Worksheets and more. Powerpoint 1:Use this ppt with a projector or computer to teach the vocabulary of colours. Powerpoint 2: Green Monster Song. Teach the green monster song around which this unit is built, using this ppt. We provide flashcards so that if you do not have computers in the classroom, you can still effectively present the language focus and because flashcards are useful to teachers in more ways than one. They can be used to practice and reinforce what has been learnt. Big-sized Flashcards : Use the big-sized cards to present and practice new language. Small-sized Monster Flashcards : Cut out the small site flashcards and use with small groups for games like slap-and-say. Big-sized Monster Flashcards : Use the big-sized cards to present and practice colours with the monster pictures. Black monster colouringUse this worksheet to practice handwriting, reading and reinforcing the words learnt. Blue monster colouring: Use this worksheet to practice handwriting, reading and reinforcing the words learnt. Green Monster colouring: Use this worksheet to practice handwriting, reading and reinforcing the words learnt. Red monster colouring: Use this worksheet to practice handwriting, reading and reinforcing the words learnt.